What Is Windows Terminal Server? Terminal servers, also often known as communication servers, are servers or hardware devices that provide terminals (printers, PCs, etc.) with a common connection point so they can be linked to a wide or local network. Remote desktop servers are basically terminal servers that let multiple users access Windows Server and use data and applications hosted on it. This is made possible with the help of presentation virtualization. Why Use Windows Terminal Servers? There are many benefits to virtual desktops. 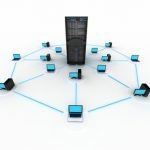 You get to use different applications and tools without needing to expand hardware, as it all runs on the virtual server that can support a number of hardware devices—and is centrally managed. Virtual desktops can even link to your local printer. You can send print requests from virtual desktops to your local printer and vice versa. Microsoft Terminal Services virtualizes the presentation of specific applications or entire desktops. This allows you to consolidate data and applications in the datacenter, while giving access to not only local users but remote users as well. Terminal servers can be a huge benefit for businesses with a large number of employees or users. They can be used to provide all users with access to an application or complete desktop, taking into account specific policies or limitations set by the IT administrator (such as geographical position, device, network connection, and more). It can be quite beneficial in running bring-your-own-device (BYOD) and choose-your-own-device (CYOD) environments as well. Parallels® Remote Application Server (RAS) can help boost the performance of your terminal servers. It’s designed to eliminate all limitations that terminal servers come with, such as options that can’t be configured on the Microsoft RDS side and stronger data security. We can also help with development, as our applications are easy to configure and manage. Try out our 30-day evaluation period of Parallels RAS and make full use of your existing infrastructure, allowing for employee devices to also connect!